Maybe the definitive Jimi Hendrix song is one he didn’t write himself. 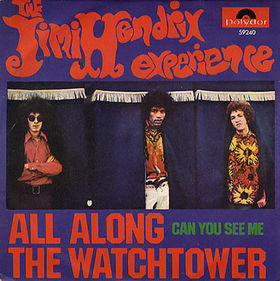 “All Along The Watchtower” was written by Bob Dylan and released in 1967 on his John Wesley Harding album, which was given to Jimi by the publicist for Dylan’s manager Albert Grossman. The song was released as part of The Jimi Hendrix Experience's third and final album called Electric Ladyland. Recording began at Olympic Studios in London on a 4 track tape recorder with Experience members Mitch Mitchell on drums and Noel Redding on bass, along with Traffic guitarist Dave Mason on acoustic 12 string. On take 7, Redding, dissatisfied with how long it was taking, left for the pub and Mason took over on bass. On takes 11 and 12 Stones guitarist Brain Jones arrived at the studio drunk and insisted on playing piano. After playing poorly, he was asked to leave and Mason returned to 12 string. Take 27 became the keeper, after which Hendrix himself added the bass. All subsequent overdubs and mixing took place at the Record Plant in New York City, first on a 12 track tape deck, then eventually on a 16 track. Rolling Stone Magazine has named “All Along The Watchtower” #47 of their 500 Greatest Songs of All Time, while Britain’s Total Guitar has it as the #1 greatest cover song of all time. The lyrics are more poetry set to music than anything, which of course, is the strength of Bob Dylan. The hook “All Along The Watchtower” is stated only once at the beginning of the last verse, yet it’s such a strong image that it supersedes the other lyrics by far. The arrangement of “All Along The Watchtower” doesn’t change all that much in terms of instruments building as much as different sounding guitars entering and exiting. The song begins with the bass, drums, and the acoustic 12 string playing the intro, which is punctuated with a vibraslap on beat 4 of every bar. Then a little twist that makes it totally interesting, and uncountable if you’re playing along, where there’s a half-beat guitar pickup going into the instrumental intro with the famous lead guitar solo line where the rest of the band enters with more intensity. On the first verse you can feel the band pull back dynamically as the music gets less intense to make room for the vocal. A new dark sounding strumming electric guitar enters on the left channel that acts like a glue for the track, and the tambourine adds the high frequencies as it pushes it along. Also, at the end of bar 16 (half-way through the verse), the bass and rhythm guitar play the last chord as a IV chord, while the 12 string guitar plays it as a flat VII. Throughout the verse a lead guitar fills in between each vocal phrase. During the first solo, the intensity once again builds with the drums and tambourine switching again to double time, then slightly lowering the intensity for the second verse but still staying with the double time feel. Once again, the lead guitar fills in the holes between the vocal phrases. In the solo section, the first one is similar to the previous lead sections in intensity and clean tone of lead guitar, but the second changes to the verse feel. In that solo, the bass also changes from a loose, ad-libbed part to one that’s structured on octaves, while the slide lead guitar pans from side to side. The next solo keeps the same feel but the lead guitar changes to a wah, which again pans left to right. The last part of solo increases in intensity while the guitar changes back to a slightly overdriven Strat sound. The last verse is identical in structure to the previous two. The outro solo section differs in that the 12 string guitar is replaced with a 6 string acoustic strumming a different, more aggressive pattern than was previously used, while the guitar and vocal ad-libs pan back and forth from left to right over the ending fade. “All Along The Watchtower” provides an interesting glimpse into the old recording world of 4 track as well as the then new world of multitrack all within the same song. You can hear the old world primarily on the drums and percussion, which were mixed in mono onto a single track. In order to make them sound stereo, they’re panned hard to the left and slightly delayed to hard right, which sounds somewhat odd as there’s a big hole in the middle as a result. This actually works to the song’s advantage as the center is filled up nicely with a number of guitars and the vocal. The tambourine, which subtly plays a big part in the song, gets the same stereo treatment as the drums. The bass is panned slightly to the left while the 12 string is panned slightly to the right. Where the new multitrack world enters is all of the different guitars layered on the song. Virtually every solo has a different guitar sound, and there’s a very low and dark but important strummed electric guitar on the left that works as the glue to the song. On the outro the 12 string turns into 6 string acoustic. There are a lot of effects layers in the song made up of several delays and delayed reverb. Except for the delay used to double them, the drums and tambouring are dry, but all of the other guitars have a slight delayed reverb that blends the track together well. The vocals and many of the guitars receive what sounds to be about a 350 millisecond tape delay with about three or four repeats. Since it’s tape, the frequency response is limited to begin with (most tapes used for tape delay wear out during the session from oxide shed, so the high frequencies suffer) so the delays decay seamlessly into the track. Be sure to listen for the long reverb tail on the 12 string guitar in the intro before the vibraslap enters, and how the solos in the middle of song pan left to right and back again, but the echo still remains on the right. “All Along The Watchtower” began as a co-production between Jimi and his manager Chas Chandler (who produced his previous two albums), but Chandler quit early in the process over Jimi’s irregular studio habits and the fact that it was taking so long to accomplish anything. Without hearing the previous takes of the song, it’s difficult to say if a better one was played before the keeper at 27, but you have to like Jimi’s instincts on keeping that one, as well as the many guitar overdubs that it took to complete the song, which was the total opposite from the quick recording of his previous records. The song has stood the test of time, and considering it’s simple form, a big reason for that can be attributed to it’s production. Everything Rock knows about the guitar after 1970 came from his psychedelic twisting of what the instrument could do. I paid homage to Hendrix with a portrait called Purple Haze on the anniversary of his passing recently. You can see it at http://dregstudiosart.blogspot.com/2011/09/purple-haze-jimi-hendrix.html and tell me how the voodoo child’s music has influenced you! Jimi will always be the best. I think what he did for guitar is similar to what Jordan did for basketball. There are many other amazing guitarist;however, there will never be another jimi. Great post keep up the hard work. Check these out IStillGotMyGuitar. They didn't add an extra beat (or half beat), it's just that the first note is on "3 and" and the vibraslaps are all on 3. This is reinforced by the lead guitar pickup using the exact same rhythm. The lack of percussion and the odd pickup beat leave the intro open to different feels. I've noticed different people feel the beat in different places. I'm totally amazed by this track. Thanks for putting this up. It has really helped with my understanding of the recording and it was really nice to have a little studio / recording history. I was delighted to hear that Jimi actually played base. The base line is really special. Also heartening to know that I'm not the only one to have struggled with the little uncountable twist. Gibson Gives In, Or Does It?